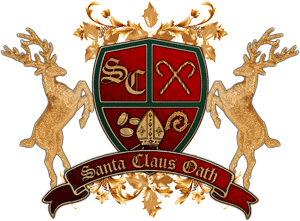 All words, contents, images and descriptions of the Santa Claus Oath are copyrighted under an attachment with Arcadia Publishing 2008 by Phillip L. Wenz.ISBN # 978-0-7385-4149-5 and LCCC # 2007925452 -All rights reserved. As Mrs. Santa Claus I solemnly pledge myself, in the Spirit of St. Nicholas, to maintain and advance my vocation as a conveyor of the true meaning of Christmas to all that I may meet in my journeys and travels. I will seek to see the enchanting wonder of each new day and seek to see that wonder in each child's eyes that I visit. The Mrs. Santa Claus Pledge/Promise/Oath and other connotations are copyrighted under an attachment with Arcadia Publishing 2011 by Phillip L. Wenz. ISBN # 978-0-7385-4149-5 and LCCC # 2007925452 - All rights reserved. As an Elf of the mystical and traditional spirit of Christmas, I do hereby affirm that I shall help spread the magic and folklore that is a part of the Santa Claus Legend. I will act as an emissary of love, hope and charity. I will always remember the true meaning of the Season by giving the gift of myself to each child or adult to whom I encounter. I will take my role seriously by serving honestly and faithfully. I pledge myself to these principles as an Elf to Santa Claus, the ambassador of St. Nicholas the gift giver of Myra. © 2009 Phillip L. Wenz. All rights reserved. Symbols - The letters S and C represent the name of Santa Claus. The candy canes symbolize the two legendary Santa's, Charles Howard and Jim Yellig. The canes are crossed as Yellig's and Howard's paths crossed only once. 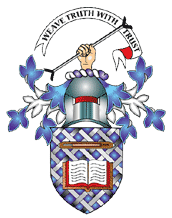 The lower part of the shield has the three acknowledged symbols of Saint Nicholas, the miter (bishop's hat) the crosier (shepherds staff) and three gold coins, representing the gold given to provide dowries to impoverished maidens. Reindeer - There are two reindeer that flank the shield. One reindeer represents designer bearded Santa's and the other represents real bearded Santa's. The reindeer have come together in unity to uphold the shield and uphold their pledge to the Santa Claus Oath.